How Profligate Was the Greek Government? 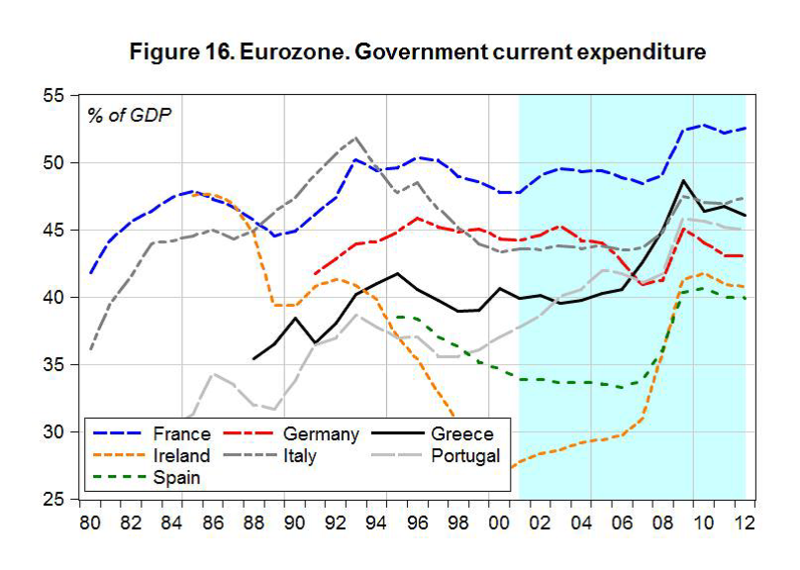 Breezily blaming the eurozone crisis on government profligacy is a widely-used journalistic shortcut, but by now it should be clear that it’s a shortcut that doesn’t help us understand what went wrong with the euro project. It has been repeated often, though evidently not often enough, that Spain, one of the hardest hit countries, had a public debt-to-GDP ratio that was a mere 27 percent before the crisis hit. And there is reason to believe that even in the case of Greece, the bogeyman of government profligacy, the popular narrative should be treated with a little more skepticism. [G]rowth in Greece during the 2000s—similar to the United States—was fueled by consumption financed by running down households’ financial assets, and/or by net borrowing. It was this unsustainable process, rather than an excessive government deficit, that put Greece on an unsustainable path. 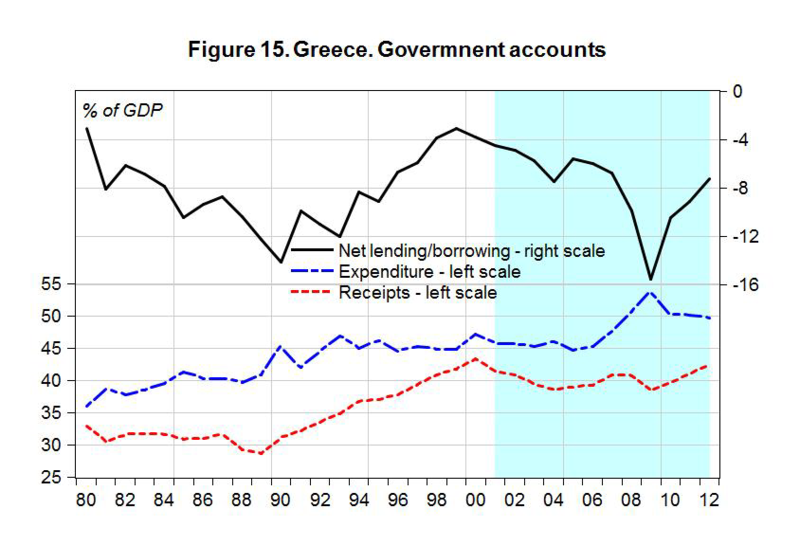 While other countries like Italy still have a net creditor position in the stock of financial assets of the private sector, so that, if necessary, a reduction in government net liabilities can be obtained through appropriation of private financial assets, this possibility is ruled out for Greece, where both the private and the public sector have a net debt against foreigners. As a result, any attempt to quickly reduce the stock of debt must imply a transfer of real, rather than financial, assets from Greece to foreigners. It is a small ecosystem. Energy flows are critical in an ecosystem. Greece has relatively little energy stocks. Therefore little ability to pay interest. The government sector interferes in the private sector attempts to correct the situation. There is less room for small,smart,frequent, efficient failures on the government side. France has nuclear power,beginning to age. “..energy stocks…ability to pay interest.” Are you commenting on an overarching economy-as-ecosystem model wherein fundamental energy energy availability is the real source of availability of interest payments? (I think of Odum and others who model economies solely as energy systems.) If so, can you suggest sources to read? Lord Acton’s view that power corrupts no longer holds true in modern enlightened socialist democracies. Our élite class -ie, people in government- uses its monopoly on the legal initiation of violence against others (a definition of government) to engender reason, peace and prosperity. All they need to do is coerce the right people at gunpoint, and life and the economy will go swimmingly.